The following are some of the most commonly asked questions. When will the homes be offered for sale? Homes are available now, based on current inventory. New homes are arriving from the factory regularly. How many homes will there be in the park? There are 229 spaces in the park, with approximate 100 vacant lots. Based on interest levels, the park owners are planning on bringing in approximately 100 new homes to fill the currently vacant spaces in the park. There is no HOA fee; there is a monthly "Space Rent" which will be $682.50. Fees are subject to change, see Park Manager for space rent lease and current rental fee. What does the "Space Rent" include? 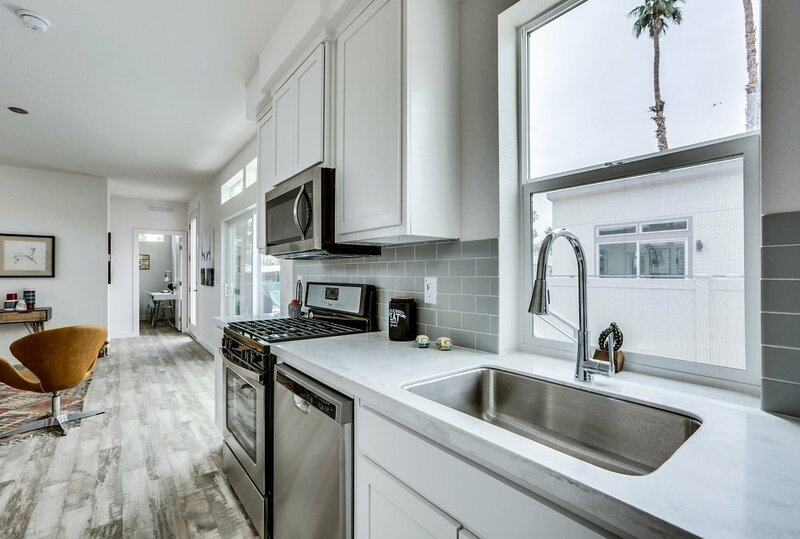 The space rent includes the actual land where the home is placed, including the site improvements to the space: fenced yards, concrete work, and hooking up the home to utilities. Each homeowner leases the space from the park owner, where their home is placed. The fee also includes trash service, water, and access to "The Club," all the park resort amenities. The monthly space rent is subject to change. See Park Manager for lease terms. Yes. Please CLICK HERE for a list of lender options. Can the home be moved? Yes. Most homes are designed so if at some point someone wanted to move it to a new location, they could. However we recommend any interested parties research what the cost would be to relocate the home. Can I order a home and put it somewhere else? No, these homes were designed exclusively for the Palm Canyon Mobile Club. Can I custom order a home? Can I choose my lot? Homes are only available on the specific lots where they are placed. See salesperson for future availability regarding choosing lots. Are they kicking out the existing homeowners in the park? No. The new park owners did not want to do that. They designed the new homes to coexist with existing residents, many who have lived in the park for years! We're looking forward to having them as neighbors and watching the community improve. Can I have the builder add a deck and carport to the home? Most homes come with a deck and or carport. Talk to your salesperson for more info. Will these homes have a license plate and be registered with the California DMV? No. These home will be registered with the HCD, the Department of Housing and Community Development. CLICK HERE for more information. What are the taxes on these homes? Is this on "Indian land?" Yes. The park owners own the park and have a 65 year master lease on the property. Individual homeowners will have a separate rental agreement directly with the park owners for their space. Is there an age restriction for the park? No. You do not have to be over 55 to live in this park. Do they allow vacation rentals and AirBNB in the homes? Nightly rentals are not allowed at the park. They will allow 30 day minimum rentals, however talk to Park Manager and review the rules and regulations to confirm. Do I have to qualify to live in the park? Yes. All residents are subject to park rules and approval. Applications must be approved prior to the sale of any homes. Please check with the main office at The Palm Canyon Mobile Club for an application. Who is the manufacturer of the homes and where are they built? Silvercrest. Their factory is located in Corona, California. Yes. Each manufacturer offers a limited warranty. See salesperson for more details. What is the "R" value of the home? We recommend the buyer confirm & review the specifications provided by the builder prior to purchase. Specifications are subject to change. What is the Seer rating on the air conditioner? We'd like to see a copy of the lease and the rules and regulations for the park. Most of the homes will be built so that the roof can support solar panels. We suggest contacting your solar provider to verify if solar installation will be compatible with these homes. Tell me more about the owners of the park? PCC MH SALES, LLC is the seller of the homes, a division of Ravinia Communities LLC (“Ravinia”), the parent company owner, and is engaged in the acquisition, development and management of manufactured housing communities across the country. Their portfolio includes assets in Florida, Ohio, Illinois, Indiana, Missouri, California, New Mexico, Kentucky, Michigan and Wisconsin. Ravinia specializes in acquiring and repositioning well-located manufactured housing communities that are under-performing the surrounding market. Many of their communities suffered from a lack of attention by the prior owner causing deferred maintenance, infrastructure problems and occupancy loss. The most common underlying cause of these issues has been limited access to capital by the prior owner. When they take over management, they develop a game plan to make necessary improvements including aesthetic and infrastructure upgrades. Their goal is to improve our communities every year. With more than 20 communities under management, comprising 4,000 home sites, spread over 10 states, Ravinia is one of the 50 largest operators of manufactured housing communities in the country. Homes pictured may not be available at the lowest advertised price. Prices may not include lot premiums, upgrades and/or options. Subject to availability. Prices, PCMC Park community amenities & details subject to change without notice. See Real Estate Broker for individual home pricing and complete details. BRE License No.01909396. Although the above questions are answered to the best of our knowledge, information provided is not warrantied or guaranteed. We recommend buyers consult with the Park Manager, and the current Rules and Regulations of the park, and manufacturers specifications regarding any specific information provided. Potential buyers must be approved by the Palm Canyon Mobile Club manager; contact Park Manager direct for Rules and Regulations, and Application.